Details: The Aruba National Archeological Museum will be setting up in an entirely new museum complex in the centre of Oranjestad at the end of 2008. Thanks to its new and considerably more spacious building and entirely new interior, the museum will take a major step forwards in terms of scale and quality. This needs to be accompanied by a further expansion and professionalisation of the organisation and a privatisation in 2010. Result: In May 2008, the museum was subjected to a quick scan and a plan of action was drawn up for the privatisation. In the follow-up phase in September 2008, an operation schedule will be drawn up focusing on the organisational start of operations in the new premises and the opening of the museum. This is scheduled for the end of 2008. Details: The Director of Frans Hals Museum-De Hallen Haarlem asked for advice and support in connection with the intended privatisation of the museum. Result: A global plan of action was drawn up that was presented to the municipal council for approval in mid-2006. State of affairs: The municipal council of Haarlem is expected to make a decision on the privatisation of the museum in the course of 2007. Details: The Director of Stedelijk Museum Schiedam requested advice and support in connection with the intended privatisation of Stedelijk Museum Schiedam. Result: In 2006, a plan of action was drawn up, as well as a project plan for the execution of the activities relating to the privatisation. State of affairs: The plan of action was adopted by the municipal council in mid-2006. The plan outlines the privatisation of the museum as of 1 January 2008. Details: In 2005, Peter Berns acted as advisor to the museum management, handling the guiding of the reorganisation and privatisation process. The reorganisation was intended to trim down the organisation, introduce the project management model and restore the museum’s financial health. These measures were intended to realise a good starting point for the museum’s privatisation. Result: The reorganisation was implemented in close consultation with the Works Council at the end of 2005 and all debts were purged. An operation schedule was drawn up for the period 2006-2009. 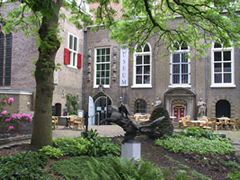 As of 1 January 2006, the museum was privatised and its operation placed with the foundation ‘Stichting tot Beheer van Museum Boijmans Van Beuningen’. Details: Formulation of a plan relating to the privatisation of Stedelijke Musea Gouda, including the consequences of such a measure for staffing, organisation, collections, building and finances. Result: Change proposal for the privatisation of Stedelijke Musea Gouda (September 2004). State of affairs: The municipal council has agreed with the privatisation of Stedelijke Musea Gouda as of 1 January 2006 (December 2004). Result: Establishment of the foundation ‘Stichting Museum Het Valkhof’ (1998), transfer and start of the new museum organisation (1999).